Monstress is a book that I personally have been excited to read for quite a while, since I was sold on it as an alternate history with fantastical Asian folklore elements. The world of Monstress already seems rich and vast in the second issue. There are so many questions from the last installment that are answered in this issue, and then brand new ones arise, heightening the intrigue. Maika herself is such an incredible mystery that it feels very easy to turn the pages to see what about her or her past will be revealed next. Maika is a mystery even to herself, and went to Zamora looking for answers. However, a true positive of this book is that Maika is not the only thing you are interested in. With this second issue you are given more insight to the world in which Maika lives. You are told more of the geo-political landscape; there is the Human Federation, the Silent Realm of the Arcanic, and the truce-lands in between where the city of Zamora is located. We get to see more of Ren, an Arcanic who is, or perhaps just resembles, a cat with two tails. This issue presents us with introductions to religion, experimental magic, a corrupt government and its secret police, and so much more. Liu and Takeda are really a great team bringing a gorgeous and folktale-like feeling to this title. The first issue was a vague set up that personally had me intrigued and this second issue really has me hooked. The Asian mythological elements are interesting and I personally enjoy that they aren’t over explained, but allowed to just be part of this rich world that is being built around us. Monstress is certainly off to a strong start and I won’t be surprised if it has a substantially large amount of things to say as this series goes on. 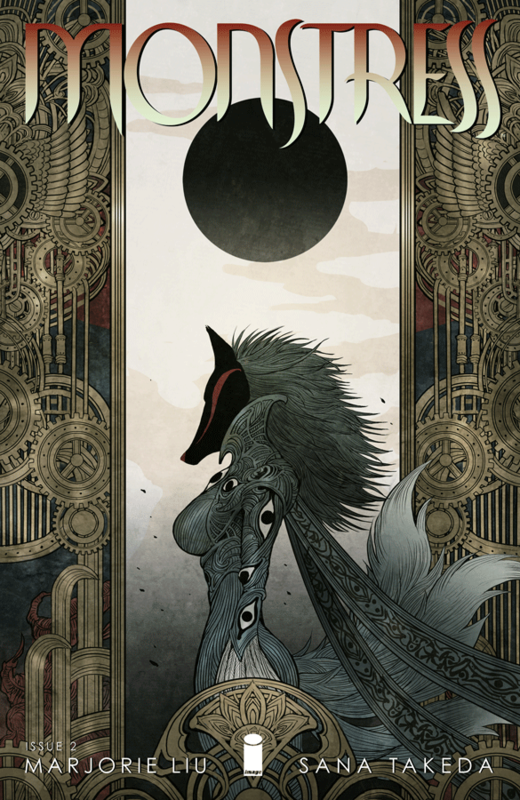 Monstress #2 is now available online and at your Local Comic Shop!